If you’re in high school and you’re thinking about college — and you should be — you should know that the courses you take now matter. That’s because college admission officers want to see a solid foundation of learning that you can build on in college. ​To create that foundation, take at least five solid academic classes every semester. Start with the basics, and then move on to challenging yourself in advanced courses. The courses listed below should prepare you for success in college and beyond. Take English every year. Traditional courses, such as American and English literature, help improve your writing skills, reading comprehension and vocabulary. Algebra and geometry help you succeed on college entrance exams and in college math classes. Take them early, so you'll have time for advanced science and math, which will help show colleges you're ready for higher-level work. Schools that are more competitive expect four years of lab science courses, which you may be able to get by taking advanced classes in these same areas. Solid foreign language study shows that you're willing to stretch beyond the basics. Many colleges require at least two years of study in the same foreign language, and some prefer more. Research indicates that students who participate in the arts often do better in school and on standardized tests. The arts help you recognize patterns, learn to notice differences and similarities, and exercise your mind in unique ways. Many colleges require or recommend one or two semesters in the arts. Good choices include studio art, dance, music and drama. To ready yourself for college-level work, enroll in challenging high school courses, such as honors classes, AP courses or IB-program courses. You may even be able to take college courses at your high school or a local college. Use College Search to look up a specific college's academic requirements to be sure you’re on track to attend the college of your choice. You can also meet with a school counselor or teacher if you have questions about choosing classes and staying on track for college. Shows where you are in having the appropriate amount of credits toward graduation. Number of courses, classes, or credits you take each semester or school year. 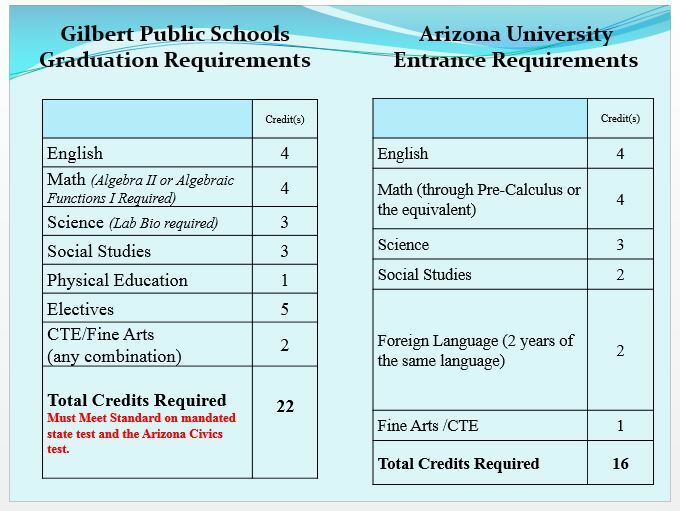 Primary method used to determine and document that students have met academic requirements, generally at the high school level. Credits are awarded upon completing and passing a course or required school program. Division of school that is related to a subject area. A record of your academic accomplishments in high school. It lists every class you took, when you took them, and the grade you received in each class, sometimes along with additional information such as standardized test scores and any honors you received.